I have been covering the Ebola story for some months now and the posts have been well received by the audience. The current world news is focused on Ebola transmission. When I last wrote a "updates post" (Link), the total number of cases was already at a record high. With more and more papers pumping in, I felt this is the right time to get back into writing an update on EBOV 2014. The current estimates is 4,500 cases (as of on 18 Oct 2014) of death, including 236 health workers with more than 9000 total reported cases (confirmed + probable + suspected). The estimates is a reflection of reported cases, and the actual number of cases is expected to be much higher due to under reporting. All cases has been stratified into 3 levels based on the evidence- confirmed, probable and suspected. See Table 1. WHO has acknowledged that it would take sometime, probably in months to completely stop the outbreak, In addition, WHO has identified 14 African countries where preparedness and containment of the disease is a priority to prevent its spread. Indeed this is the most devastating of all EBOV outbreaks to date. 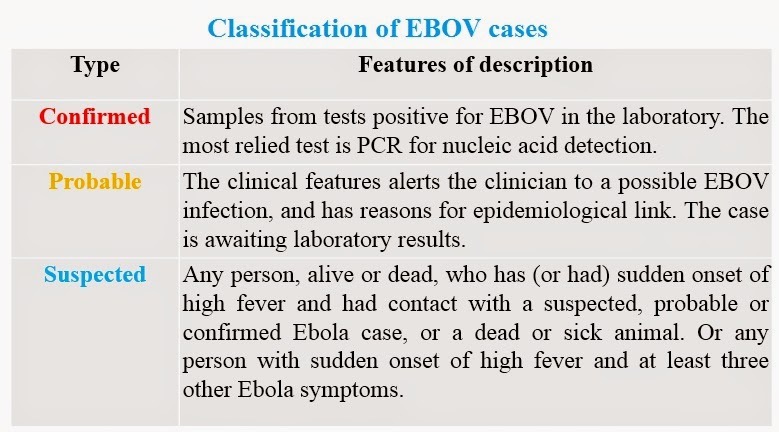 Senegal had reported a confirmed case of EBOV on 29 August 2014, in a young man who had direct contact with Ebola patient. As per the response plan, 74 close contacts of the patient was tightly monitored, strong surveillance system and public awareness programs was conducted. The result is no more case detection and WHO has officially announced Senegal free of EBOV (Link). A fresh confirmed case of EBOV infection has been reported from Spain, a healthcare worker. She had been in contact with EBOV infected spanish citizen. A detailed report is given in WHO website (Link). One of the most common practice in ongoing outbreaks is to create mathematical models. However, the point of creating models is seldom understood by many. Mathematical models (MM), can predict the nature and dynamics of outbreak and is usually relevant in terms of predicting the future needs. However, they many a times fail to predict future completely since the parameters of the equation can change radically. In this sense it is important to understand that the models should be used with caution and not relied too much upon as an answer. One of the most important factors that determine the mathematical predictions and ability of outbreak, is based on a measure called as R0. R0, is an epidemiological parameter in infectious disease, which basically means basic reproduction number/ rate. It is the number of people who transmit the infection from one sick person, on average, in an outbreak, in other word "contagiousness". If R0<1 then there would be no epidemic since the outbreak would die easily. If the R0>1 then the spread will be much better. For the current strain the R0 value lies between 1 and 2. There are 2 questions that I keep getting and bothers people. How fatal is Ebola and can Ebola be airborne. As I have commented in a previous Ebola post, a lot of misunderstanding in science comes from the fiction movies. The movie outbreak features a mutated virus that is airborne. In real life situation, that is a totally improbable situation. I have seen internet materials, claiming it just takes a few mutations. The point is it would take too many mutations way to far that we could call it some other virus. to change the route of transmission means acquire new counter defense mechanisms, new receptors, new replication strategy. too much for a few mutations to come up with. Not even the 300 plus mutations that has been found in the new strain. People who are still in doubt, please listen to TWiV podcast #TWiV 304. To the best of the knowledge of science there is no such documented evidence. The second question is a little more tricky to talk about. All the while you are told that EBOV is a severely fatal illness. But is it really so? The concept of fatality in infections are usually measured in terms of Case Fatality ratio. That means number of people who die in ratio to number of people who turn up into the hospital. In the current outbreak this ratio is about 50%. "Results from one post-Ebola outbreak serosurvey showed that 71% of seropositive individuals did not have the disease; another study reported that 46% of asymptomatic close contacts of patients with Ebola were seropositive." A quick conclusion that I can draw is that probably EBOV, isn't as fatal as it is projected to be. To give an exact estimate is difficult cause I'm not aware of any data in this regard. However, it could be confidently proposed that it is not 100%. One of the latest interest in treatment of EBOV is the use of a candidate drug called Brincidofovir (CMX001). This is a chemically modified cidofovir with a lipid tail. Cidofovir is was developed as an injectable drug. The mechanism of action is not well known. The drug basically is converted to cidofovir diphosphate by phosphorylation which acts as a substrate for viral DNA polymerases, leading to inefficient processing by unknown mechanism. The drug is currently developed by chimerix. Despite the fat that EBOV is a RNA virus, in cell culture assays, the drug has shown significant activity and hence in under the consideration as a option. Thomas Eric Duncan also known as the Dallus patient, had contracted EBOV from liberia, was offered this drug as per the compassionate use protocol, without success. Another person, Ashoka Mukpo had also received the drug and seems to be recovering. Given the fact that at least 50% of the cases survive, it is hard to tell the actual efficacy of drug in this case. From the current scenario a rough conclusion that probably the outbreak has now slowly begun to die out. With an international awareness and effort the number of reported cases slowly seems to come down. Though a complete shut down of the spread will take some time, This outbreak highlighted the lack of basic science research. And perhaps as Vincent says in his post, there is a huge need for improved funding and a tight slap on face people who say we don't need BSL-4 level research. Y not an irresistible antibiotic! !